As anyone who has ever remodeled a house knows, sometimes “easy” just means easier than the alternative. Easy also may mean that you are cutting corners or hiring someone else to do the work. In this case, we’re doing both! We have long questioned how far we wanted to go on this back bedroom, which was formerly Chloe’s room and is now destined to become our family room. The plaster is cracked in quite a few places, although to some extent that’s been mitigated by the multiple layers of wallpaper. On our ambitious days, we’ve talked about stripping off the wallpaper and repairing the plaster. In our more lazy moments, we’ve contemplated doing nothing and just moving a couch our TV into the room. But, as we’ve gotten really tired of shuffling things around our house as projects move from one area to the next, we did commit to not “temporarily” start using this room, a phrase that for us usually equates to at least two years before we fix it up. Our compromise in this case was to remove all the trim, so that we can have someone (not us!) come in and install 1/4″ drywall over all the walls. While the plaster purists out there will be appalled, we just don’t have the time or patience right now to strip off all the wallpaper and fix up the plaster. I spent about 3 hours removing all the trim today as the first phase of this project, and tomorrow I’m going to call to get a quote on the drywall work. The salvageable trim will go to Houck’s for stripping, and we will install new base trim. One of the previous renters had a dog that did an amazing amount of damage to the base trim, so it was shot. We will probably take the picture rail to the Rebuilding Center, because I’d rather go with crown, and there is no other picture rail in the entire house. Anyway, once get the walls “restored,” we’ll refinish our stripped trim and replace the trim that wasn’t salvageable. And between getting a quote and actually getting the drywall up, I am going to rough in some wiring for the TV. Our goal is to have this room finished by the time Stephanie starts teaching again in late September. You guys make me feel so normal! I just love reading your posts ’cause they always allow me to say, “see, they do it too!” Bless you!!! We have many stories that could make you feel even better, but we’re not going to post them on this site! We’re still looking for a drywaller, having just gotten a shockingly high estimate from someone we’ve used in the past (who USED TO BE reasonably priced.) I’m happy to pass along contact info though, as soon as we figure out who we’re using! Your kitchen is looking fantastic, by the way! 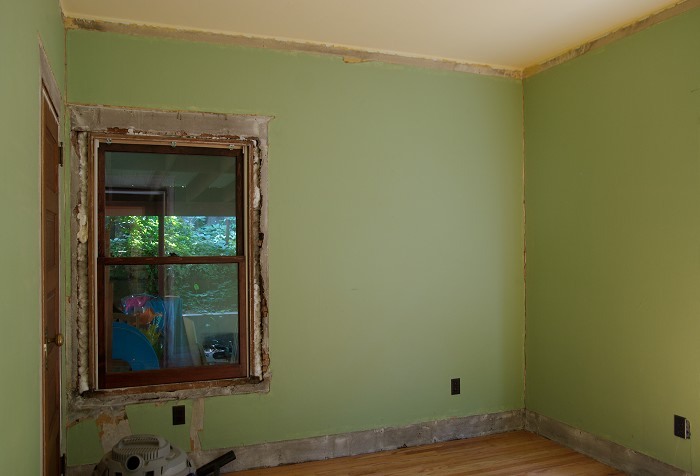 Pingback: Bungalow Insanity » Drywall is done! Next Next post: I *heart* Ikea Hacker!